Planning an event? We are happy to help with your parking needs to facilitate the best possible experience for your guests. Access the online Service Request Form. Complete all fields with an * on the form, to include a valid UM departmental Workday PG account number for billing purposes. Submit the form with a minimum notice of seven (7) business days prior to your event; we cannot guarantee services that do not meet this minimum time. Email events@miami.edu for all correspondence pertaining to events. Remember, UM is a smoke-free campus, so please advise all guests of our policy. Events longer than seven (7) days in duration, please contact Event Services directly at 305-284-1641. Events that require food trucks, large vehicles or equipment, must complete and submit an approved Coral Gables Campus Revocable Agreement for Use of University Facilities. Please contact Business Services at 305-284-5550 for assistance. Electronic Message boards are required for events with an audience of 2,000 or more; a nominal fee applies. The boards are strategically placed to keep all drivers (event attendees and local community) informed. Parking and Transportation should be consulted regarding artwork placed on directional signs and sandwich boards (A-frames) in order to ensure alignment with campus traffic. UMPD services are required with events that need intersection control on Ponce de Leon Boulevard, serving of alcohol or reinforcement. Visit the UMPD website. Certain events require that an area of a lot or a number of spaces be reserved. In most cases, this requires a lot attendant (nominal fee) to secure the area, regardless of the number of spaces. Spaces without an attendant cannot be guaranteed. Your event may require staff resources to secure lots and parking spaces, traffic control, maintain pedestrian safety, etc. Our event team will assist in determining the right mix for your event. Parking and Transportation reserves the right to determine the type of staff resources that best suits your event, based on variables such as traffic flow, construction, and/or other events taking place in the area. We will consult with you during the process of arranging your services. You must give at minimum, a seven (7) business-days' notice, in order for us to staff an event. Shuttle service is available and prices vary depending on your need, for example, shuttle type/size, usage time and trip distance. Refer to Shuttle Rates. You may book directly through Academy Bus Company at 305-688-7700 ext. 1. Or, if arranged through Parking and Transportation via the online Service Request Form, you will incur a 10% administrative fee. We offer a convenient, efficient and professional level of valet service. A valet parking attendant is often the first point of personal contact at any event. 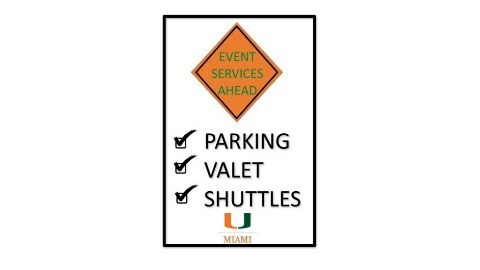 Valet service is provided by UM's authorized vendor, which is supervised and equipped by Parking and Transportation. Rates vary based on the estimated number of vehicles expected for the event. Refer to Valet Rates. Please note, valet staffing depends on the size and location of the event, as well as the distance of the vehicle staging area from the drop-off/pick-up points. Our expectation is to deliver the highest level of customer service by requiring sufficient valet staff in order to meet a vehicle retrieval time of 4-6 minutes. For information regarding Golf Car Rental, please contact Broward Electric Car and Equipment at 954-925-2400. Familiarize yourself with the significant information that follows to ensure your event planning is in compliance with the City of Coral Gables and the University. Service & Delivery Supplier Guidelines - This link contains important information with specific details regarding the ingress & egress campus access roads to use, approved loading & unloading areas and governing policies. Delivery Access Roads - This map shows which access roads delivery vendors need to use to enter/exit campus. Signage letter from City Manager 040708.pdf (open link) and Temporary Signage Map 2015.pdf (open link) – These links explain the time signs may be placed outdoors and by when they need to be remove; size and placement. Equipment (i.e. tents, large equipment/vehicles) removal needs to occur within 2-hours after the event concludes, specifically if it impacts parking areas or traffic flow. If an exception is needed, contact Parking and Transportation at 305.284.1641 for review. Survey parking area(s) and immediate roadway for any damages incurred during the event for example: curbside or landscaping damage caused by delivery vehicle or event-goers; outdoor tents used and secured to the ground by drilling holes (asphalt needs to be resurfaced) instead of utilizing weighted sandbags or water barrels. Contact Facilities Management and Parking and Transportation as required. Students requiring a POD to facilitate their Move-Out or Move-In activity must familiarize themselves with the important information found in these links. Once the student contracts a POD company, the company must contact Event Services at parking.events@miami.edu to secure a space to place the POD; otherwise, the POD delivery will be denied. For additional helpful information, visit Student Affairs Housing & Residential Life.